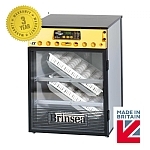 The Series II range of the popular OvaEasy Cabinet Incubators now extends from the compact, table-top OvaEasy 100 to the high capacity OvaEasy 580 and Hatcher combination, all providing the same consistently high hatch rates and value. The OvaEasy 100 Advance Series II is fitted with Brinsea's proven digital control system which provides a range of useful and easy-to-use extra features like humidity readout and temperature alarms. It can be easily upgraded to EX specification providing fully automatic humidity control. Ova-Easy Advance Series II incubators now have improved features which include room temperature alarms to warn if the environmental temperature goes outside the optimum range and a new single button press to automatically level the shelves for tray access. Eggs can be at risk if the room temperature gets too hot or too cold, and the Series II room temperature alarm warns you should room temperature move outside the optimal range. A single button press automatically levels the egg trays without the user having to wait meaning no watching and waiting for the trays to be level. Revised cabinet design improves panel fit for better temperature and humidity control and higher efficiency.